Looking to develop a career as a Technical Writer? If so, this programme offers flexible pathways. Flyers for all Computer Science programmes. Link to the student timetable system with lecture and lab details. This is a graduate conversion programme and is open to Level 8 graduates from all disciplines. Information developers make information more useable and accessible. Job opportunities include: Technical Writers & Editors, Information Architects, Instructional Designers, Localisation Specialists, Visual Designers, Web Designers, Trainers and E-Learning Developers. The value that information developers deliver is twofold; they make information more useable and accessible to those who need that information, and in doing so, they advance the goals of the companies or organisations that employ them. 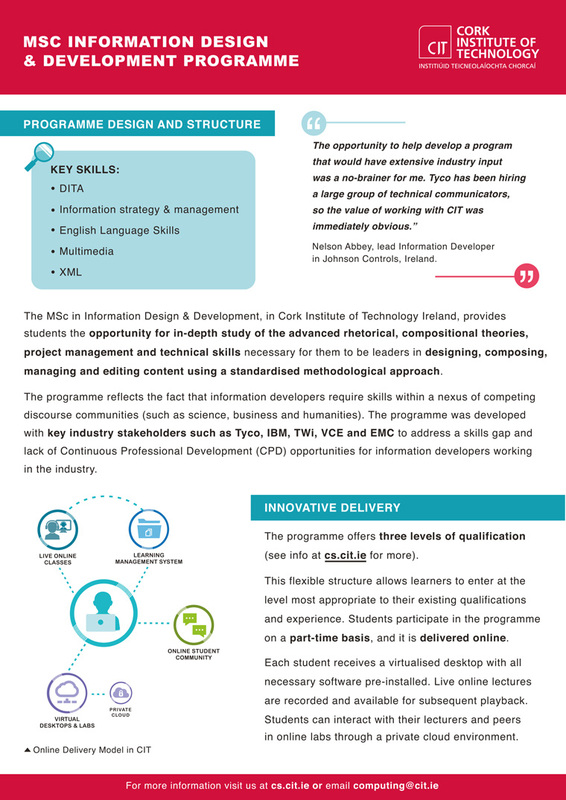 The following is a partial list of the different jobs within information development: Technical Writers & Editors, Information Architects, Instructional Designers, Technical Illustrators, Localisation Specialists, Usability & Human Factors Professionals, Visual Designers, Web Designers & Developers, Trainers and E-Learning Developers. If it is not worth documenting, it is not worth anything. Information Developers are individuals who bridge the gap between subject matter experts and that of the end user. The role of information developers is becoming increasingly important given that society is being driven by technology and information developers provide the voice in communicating how issues incorporating technology are framed and developed. The Society of Technical Communication (STC) define information developers or technical communicators as individuals that communicate using an instruction based focus on technical or specialised topics using technology. In essence, information development and technical communications ensures that designs, products, systems and methodologies are documented and conveyed to their target audience to maximise its business value to the organisation. Click this link or the image over to download the programme flyer which contains links to the complete list of modules. Internationally recognised industry leaders such as Dr JoAnn Hackos and Ms Ann Rockley teach on this programme. In addition to industry experts, academic experts in the field of XML, technical communication and information experience also deliver modules. The articles highlight the high level of industry engagement in the development of the programme. The Institute of Scientific and Technical Communicators in the UK publish a free online newsletter each month called InfoPlus which featured an article about the programme. Philip Large, a student on the MSc in Information Design & Development also shares his experience of participating on the programme which was published also in InfoPlus. 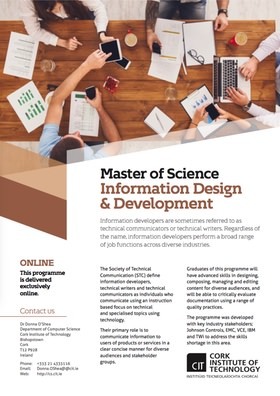 A professional master’s degree programme in information design and development will provide students the opportunity for in-depth study of the advanced rhetorical, compositional theories, project management and technical skills necessary for them to be leaders in designing, composing, managing and editing content using a standardised methodological approach. The programme reflects the fact that information developers require skills within a nexus of competing discourse communities (such as science, business and humanities). A pdf of the programme poster is also available here. Who should apply for this programme? Do you come from a humanities background and want to move into the field of technical communications? Are you a working as an engineer or developer and want to move into the field of technical communications? Are you working as an information developer and want to advance your career with a professional master’s degree in the area? Apply now if you can answer yes to any of the questions above. Information Design and Development - information developers need to develop a rigorous standard in the production of clear, concise technical documents using correct English. This programme helps develop these skills. Please click here or the programme schedule button for full module details. Structured Content & DITA - XML and in particular Darwin Information Typing Architecture (DITA) is a major technological advancement to the field of information development and provides a platform independent, vendor neutral source language for publishing documentation to any output format. Given the benefits of XML/DITA to the information development process, information developers are now required to understand the technology and embed it into their everyday work practices. As part of this programme students will learn skills in how to develop structured content using DITA. Project Management - the use of XML/DITA introduces new challenges in project management and best practices. Information will no longer be developed as monolithic documents but instead a topic based approach will be used in modern day information development practices. Use of topics will allow the creation of standalone information solutions that can be easily reconfigured and reused to suit various audience stakeholders at a reduced cost of production. Managing topics compared to book-oriented development introduces new complexities in estimating, scheduling and tracking projects and in this programme students will be given the skills to deal with these complexities. Audience and research skills - Knowing and understanding your customer is key to being a successful entrepreneur. The same principle can be applied to information developers where knowing or anticipating who will read your document is key in determining how effective the content will be. Information developers need research skills to investigate a particular topic and to understand their audience this information, they can then adapt their writing style and adjust the voice or tone of the document to acknowledge different stakeholder groups. Under the banner of information development, the role may also be referred to as technical communicators, documentation specialist, information architects, editor, or go by another name. Regardless of the name, information developers perform a broad range of job functions across diverse industries. Their primary role is to communicate information to users of products or services in a clear concise manner for diverse audiences and stakeholder groups. At the end of this programme students will be able have advanced skills in skills in designing, composing, managing and editing content using a standardised methodological approach for diverse audiences; and critically evaluate documentation using a range of quality practices. Please click the "Apply Now" button to make an online application for this programme. The CIT online application system will open in a new window and this will allow you to enter details of your application for this programme. Fields marked with a red asterisk are required fields and need to be completed. You can use the supporting documentation section to add scanned copies of transcripts, your CV, or any other relevant documentation. Please study the entry requirements for this programme and ensure that you've supplied all information that's relevant to your application.